Monetarists argue that if the Money Supply rises faster than the rate of growth of national income, then there will be inflation. If the money supply increases in line with real output then there will be no inflation. “Inflation is always and everywhere a monetary phenomenon in the sense that it is and can be produced only by a more rapid increase in the quantity of money than in output. Friedman (1970) The Counter-Revolution in Monetary Theory. The above equation must hold the value of expenditure on goods and services must equal the value of output. If the total money supply is initially £1000 and the velocity of circulation is 5. The level of output (Y) is 5000 units. If the output is 1,000 units, and there is a money supply of £10,000. The average price of good will be £10. In year 2, if the output stays at 1,000 units, but money supply increases to 15,000. Consumers have more money to buy the same amount of goods. Therefore, firms put up prices to reflect this increase in money supply. Ceteris paribus, average prices will rise from £10 to £15. Milton Friedman predicted an increase in the money supply would take about 9-12 months to lead to higher output. Friedman placed great emphasis on the role of price expectations. If there are expectations of higher inflation, it becomes self-fulfilling – workers demand higher wages to meet rising living costs. Firms put up prices to meet rising costs. Strict monetarist policies would help reduce expectations. Monetarism became more popular in the 1970s due to rising inflation. (partly caused by rising oil prices). In the early 1980s, the UK and US adopted monetarist policies with mixed results. Milton Friedman argued that the money supply should rise by a fixed k-percent each year. This rate of increase should depend on institutional factors and be determined independently of policymakers. Friedman believed this rule would avoid the extremes of deflation (Falling money supply, e.g. Great Depression) and inflation due to rising money supply. It would give business strong expectations of what would happen to money supply and inflation. Following a rise in the Money Supply, consumers have more money and therefore spend more money on goods; this shifts AD to the right. AD1 to AD 2. Firms respond by increasing output along SRAS. Real output increases from Y1 to Y2. National output now exceeds the equilibrium level of output. Therefore there is an inflationary gap. Firms need to hire more workers, so wages rise leading to an increase in costs and hence prices. Initially, workers agree to work more hours because they see an increase in nominal wages. Also, workers realise the increase in nominal wage is not a real wage increase. Therefore, workers also demand higher nominal wages to produce more output and to compensate them for rising prices, therefore SRAS shifts to the left. The economy has returned to the equilibrium level of output (Y1), but at a higher price level (P3). 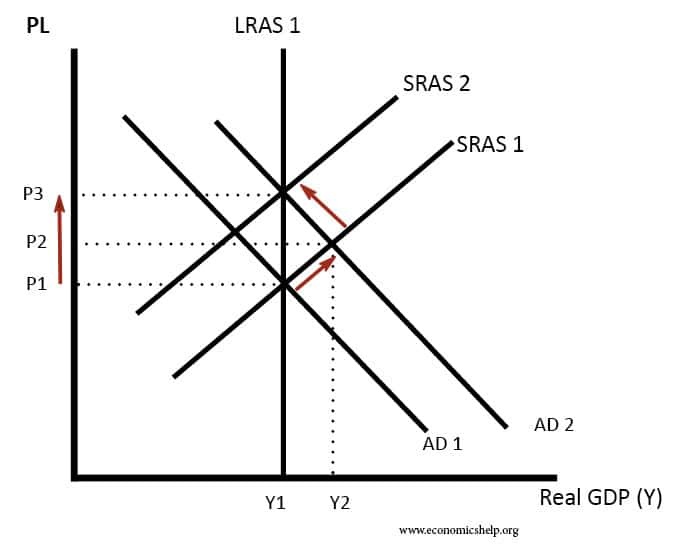 Therefore the rise in the Money Supply cause a rise in AD, But because the LRAS is inelastic there is no increase in real output, but inflation rises. It is a form of demand-pull inflation. 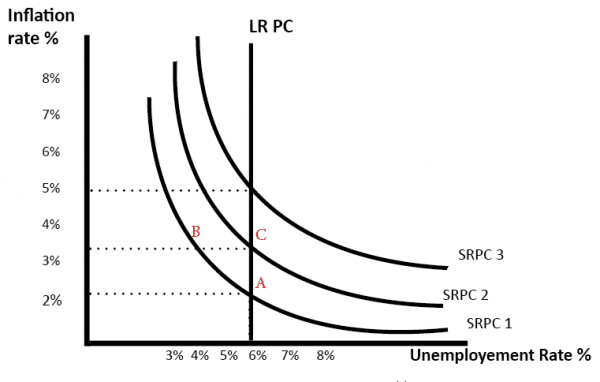 Monetarists believe in the long-run there is no trade-off between inflation and unemployment. Increase in the money supply only causes an increase in nominal GDP, but not real GDP. The link between the money supply and inflation is often very weak in practice. Targetting arbitrary money supply targets can cause a severe recession and high unemployment. For example, UK targetted money supply growth in the early 1980s, but this caused recession of 1981 with many economists arguing it was deeper than necessary. The Large increase in the monetary base following 2009 recession did not cause any inflationary pressures. Why does an increase in the money supply cause inflation?